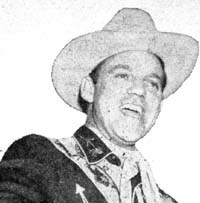 For the Pine Hollow Jamboree, it all got started with an idea a fellow by the name of Woody Woodell had in Mercer County Pennsylvania. Woody had been entertaining folks for a while as you will see, but when he was in Sharon, Pennsylvania, he started a Saturday night feature over WPIC from 7:00 to 8:00pm that was first sponsored by Schuster Coal and Ice. Woody was all of five feet eight inches and wore his Stetson hat at the studios of WPIC and WPIC-FM on Pine Hollow Boulevard (where the show took its name from) and played the part of emcee and manager of the show. Like many of the jamboree radio shows of this era, the audience was invited to come on in and see the show in person. And after the show started, the crowds did indeed come and fill the studios, spilling out in to the library and lobby. Outgrowing the studios, Woody moved the show to the Elk's auditorium in Farrell and even began to charge an admission fee. That didn't stop the crowds from coming as the audience kept growing as did the number of acts performing on the show. They soon outgrew the Elk's auditorium and then moved to the Reynolds auditorium that was on Sharon-Greenville Road. By that time, they wrote that the Pine Hollow Jamboree was playing to crowds of 1,200 to 1,300 every Saturday night with folks driving in from the distant towns of Emelenton, Oil City, Canton, Cleveland and even from West Virginia. Hillbilly music fans would drive for miles to hear the music in person, don't you know? The acts that Woody Woodell had on his show were performers and groups that were from places such as Sharon, Youngstown, Ashtabula, Erie and other towns in the area.